Cindy is introduced by Goldie Denise who asks her about her first experience with the PEMF Omnium1 Mat. PEMF (Pulsed ElectroMagnetic Field) Therapy. Cindy is a Nurse. I have done full body alignments for about 17 years so I’ve worked with energy healing for many, many years. First time I ever came across a mat or even hearing about it. I had my leg broken 6 years ago by 2 dogs playing. I have a 6 inch metal piece in the tibia area and I have a metal piece under my kneecap and about 32 screws holding my leg together. First time on the mat I actually have felt the blood flowing. Goldie: This made you want to come back! Goldie introduced Cindy and she will tell 2nd and 3rd experiences with sessions on the PEMF Mat. Cindy had an accident with her leg 6 years ago. 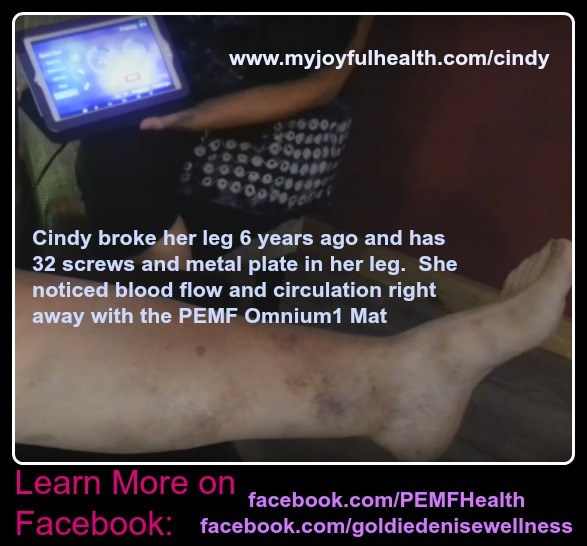 Cindy: My second time on the PEMF Omnium1 Mat was very intense. I actually felt the femoral artery pumping the blood from my ankle right up into my groin area. My pelvis and my left hip had obviously been out for many, many years. I was always told I had a tilted pelvis area. Cindy: Yes – it was twisted. Nobody had ever been able to get it back in place. I’ve been to Chiropractors and I have all kinds of gadgets that I have bought and spent money on over the years and none of that has ever worked. But the 2nd time on the PEMF Mat I actually had a very warm feeling to start with and then I could feel the Femoral Artery pumping literally. My hip and the left side of my pelvis was actually in a lot of pain. Then I thought, I’ll just work through this and breathe. I know energy does strange things to the body when it is healing. Cindy: I could actually feel my left side straightening out. I have not been able to lay flat on my back on a hard surface for many years. My lower back sunk right into the table, as well as my shoulders. Any other time it would have gone into spasm. It is just an awesome product and I cannot be happier with the results I have gotten. Goldie: Thank you for sharing. You are one of the most expressive individuals who have really felt the energy of the mat. It seems to be an accelerator; an accelerator of helping the body heal itself. Just to summarize this: During your first experience you finally had feeling and blood flow in your foot. and your second and third time it went all the way up from your femoral artery. Cindy: Yes, right into the groin and into my hip and pelvis region. Goldie: Each time it is accumulative. If you have happy, healthy cells, you have a happy, healthy body. Be sure to sign up for our PEMF-JOY Newsletter, to learn more about Pulsed ElectroMagnetic Field Therapy!